If perceiving value from the customer’s perspective is fundamental to Lean thinking, then Sales and After-sales sit at the front line of its implementation. Sales is an area in which outmoded ideas have become entrenched. For example, the “law of large numbers”, which posits that the most effective way to increase sales is by increasing sales activities throughout the sales process, is commonly accepted in all sectors and around the world – yet it fundamentally fails to address neither the efficiency nor the effectiveness of the sales activities themselves. Instead, a more rigorous approach is needed. Starting with improved and up to date sales and after-sales information, Lean approaches this function much as it does all others – reducing complexity, focusing on the customers and what adds value from their perspective and finding solutions that fit the challenges. 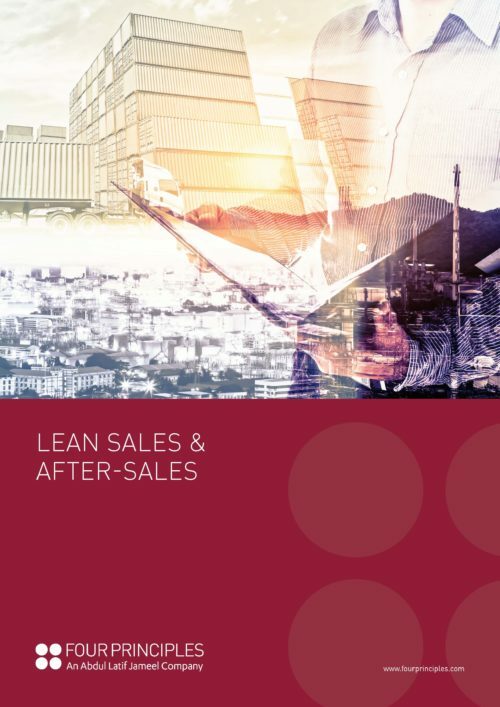 A common issue facing many sales and after-sales functions – irrespective of sector – is the propensity to adopt a silo mentality between process stages. Lean solutions work towards reducing this, nurturing and embedding greater transparency and collaboration between multiple organisational interfaces whilst simultaneously clarifying roles and responsibilities. Functionally, sales and after-sales have the capacity to generate a great deal of unnecessary waste – from travelling, movement and waiting to inventory, where excess promotional material, stocked sales literature and batch processing of sales reports can make for bloated operational processes. By freeing up front line staff from duplication of supporting work, Lean enables them to do the jobs they are supposed to be doing: serving the customer, providing better service and – as a result – not only increasing sales, but significantly improving customer satisfaction and likelihood of repeat business and recommendation.